Home Stories Find Out Why This McDonald’s Window Has Got EVERYONE Talking! Spring Hill, Tennessee. A fast food restaurant is causing quite the stir at the moment. 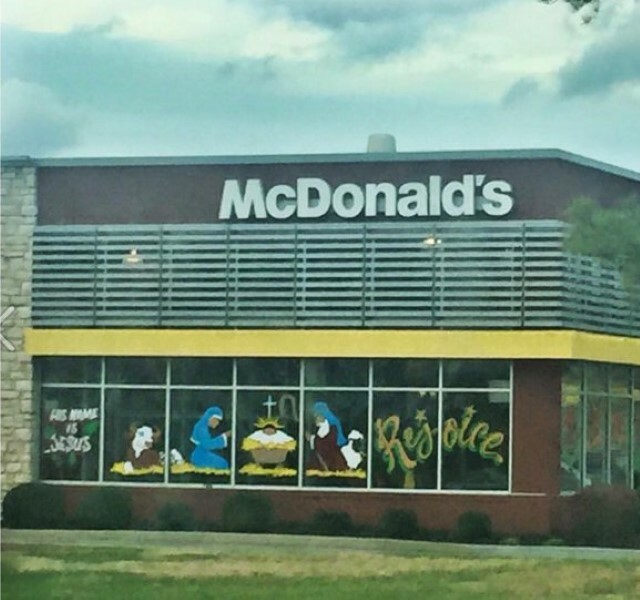 As Christmas approaches, the owners of five local McDonald’s restaurants paint large scale nativity scenes of their restaurant windows, in celebration of the time of year and Christ’s birth. The picture was taken by a lady called Amy Basel and uploaded onto her Facebook page, along with this message: “Drove by and did a double-take. Growing up in the mitten, you would NEVER see this. Tennessee McDonald’s…you made my day. ‘His name is Jesus’.” It’s since got more than 130,000 likes and over 80,000 shares! Next articleThis Story Of Friendship At Christmas Is GUARANTEED To Make Your Day! Wait ‘Til You See The New ‘Throwable Fire Extinguishers’ – They AMAZING!